Contents Processing Centre (also known as CPC), has been a part of the Windsor-Essex community for almost a decade now. While sitting quietly along the nondescript Oldcastle area, its goings on are anything but mundane. A journalistic mission for WOC, and my own curiosity brought me to the offices of CPC one January morning this year, where I was pleasantly surprised to come across a team of diligent individuals discretely doing their part in contributing to environmental preservation, but in a unique and unsuspecting way. The practice of contents processing is unfamiliar to many of us. In fact, most everyday consumers would not have a direct connection to businesses like these, but they play a crucial role in rehabilitating and restoring property after major disasters. Jeremy Brown, Content Evaluation Specialist at CPC, elucidates: “Contents processing is a newer term so there really is not a searchable definition. It represents the framework, process, and equipment required to efficiently manage contents affected by an insurance claim from a disaster event”. So, in the event of a major flood, instead of tossing damaged items into the garbage, burying them into already over packed landfills, and finding replacement items, the insureds (you and I) make a request to their insurance claim representative or the attending contractor inspecting damage, to opt for “contents processing”. This would be in contrast to writing it all off and adding more CO2 emissions to an already fragile ecosystem. Cleaning costs average around 20% of the value of an item. This means less paperwork and expenses for the insurance company when processing claim settlements for total loss items. They obtain the option to retain sentimental and historically high value items. Additionally, not having to shop to replace clothing and furniture, and not having to report the claim, which includes having to work through tedious paperwork, means a lot less disruption in their lives (sometimes, it takes clients years to find receipts of old items, get quotes, and search for costs of replacement items to report to their insurer). Items lost on a claim have many underlying impacts based on the embodied energy (the sum of all the energy required to produce any goods or services, considered as if that energy was incorporated or 'embodied' in the product itself. This includes the energy from material extraction, refining, processing, transporting, and fabricating), in the original item on landfill waste. In addition, there is the added environmental cost from the embodied energy in the subsequent replacement item. Contents processing works to reduce these impacts using technology and processes that in themselves have a minimal carbon footprint. Windsor-Essex county has experienced two 1-in-100-year floods, and multiple storm events during the past two years alone. Preliminary insurance-loss estimates in 2016 alone exceeded $108 million, with over 6,100 claims, while many additional losses were not covered by insurance. Extensive research conducted by scientific organizations predict that such weather is here to stay for the region, at least for the foreseeable future. With civic infrastructure pending major updates, intense rainfall events will occur often, increasing the need for a sustainable model for restoration of property. “The way this works is,” Jeremy explains, “items identified by our personnel that can be salvaged from the scene of the disaster are first received at CPC. These items we then submit to our production cleaning process, which includes hydraulic wash systems, ultrasonic cleaners, and steam cleaning, all of which are environmentally conservative practices. "We are modeling our business to ultimately clean and recover rather than to discard and replace. By using environmentally friendly cleaning processes we are minimizing our footprint and the overall impact from claims events. All of our equipment has ensured an average yearly recovery rate of damaged items of up to 82% of all claims”. CPC's cleaning processes help create a recovery rate that directly converts to an average landfill diversion of over 540 metric tons of CO2 emissions (including CPC’s operating carbon footprint), since their opening. While salvaging and restoring property affected during a disaster event seems more like the economically and environmentally sound option, a lot of eco-conscious individuals still opt to toss it in the trash. An often-expressed concern is sewer damage, that individuals automatically deem as non-restorable items. “Sewer backup claims constitute 5% of our overall claims - a relatively small amount. We have standard policies regarding writing off clothing, toys, infant items, and textiles that have been in direct contact with sewage (even though we have technologies to safely restore these items). Our balanced approach to sewer backups involves cleaning what makes sense and discarding what makes sense." The expedition to CPC brought many surprises, the most important of which was how little known these businesses really are. While victims slowly start putting their lives back together in the aftermath of disaster events , green businesses like CPC in our own community try to re-establish their lives by retaining some semblance of their past homes, and by extension, Mother Nature’s as well. To learn more about CPC, visit http://www.cpcwindsor.com/. 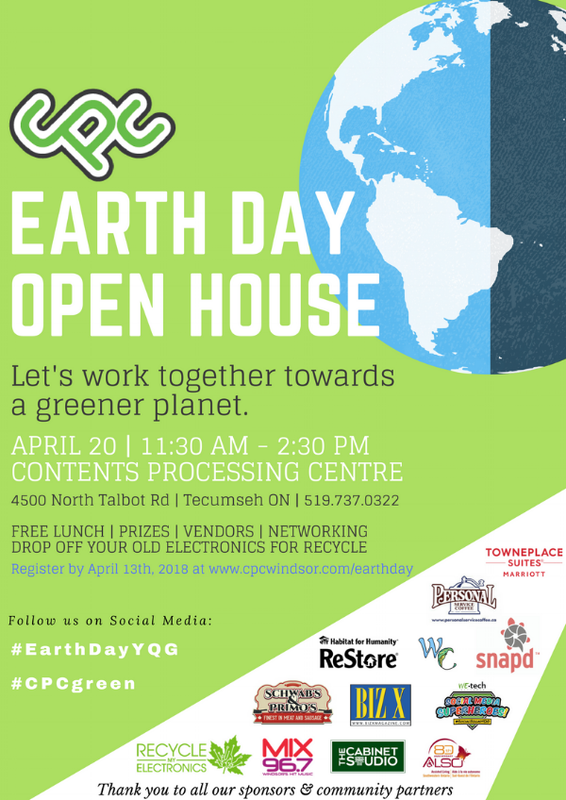 CPC is hosting their first ever Earth Day event on April 20th, 2018. To celebrate with them and learn more, see flyer! Recovery Rate: The amount of previously unusable items affected by damage that were successfully reinstated to a safe and usable condition.